Data from Crypto Fund Research reveals that crypto funds continue to launch at record rate despite a slowdown in traditional hedge fund launches. SAN FRANCISCO, (October 10, 2018) – 90 cryptocurrency hedge funds launched in the first three quarters of 2018, on track for 120 for the fiscal year, according to Crypto Fund Research. The record rate of new crypto hedge fund launches defies traditional thinking that hedge funds tend to launch most frequently in bull markets. Leading cryptocurrencies, like Bitcoin and Ethereum, are down 50% or more YTD 2018. Overall, approximately 600 hedge funds, including both traditional and crypto funds, are expected to launch in 2018, according to Hedge Fund Research. 120, or 20%, of these will be crypto hedge funds. Crypto hedge funds invest largely, or exclusively, in cryptocurrencies like Bitcoin, Ethereum, and Ripple. Some also invest and trade in initial coin offerings (ICOs). 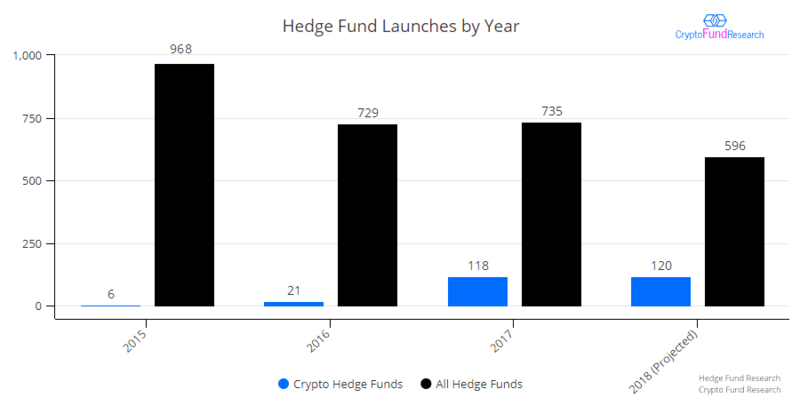 In 2017, crypto hedge funds accounted for 16% of new hedge fund launches, up from less than 3% in 2016. The number of crypto hedge funds has skyrocketed since the beginning of 2017. Two thirds of all currently operational crypto funds have launched in the last seven quarters, through Q3 2018. While crypto hedge funds are now one of the fastest growing hedge fund strategies, crypto funds still make up a small percentage of the overall industry, both in terms of raw numbers as well as assets under management. According to Crypto Fund Research, there are currently 303 crypto hedge funds. Crypto-focused hedge funds comprise just 3% of the more than 9,000 hedge funds currently in operation. Crypto hedge fund assets, at less than $4 billion, are also still quite meager. The global hedge fund industry, by comparison, manages more than $3 trillion. Crypto hedge funds constitute just under half of the broader class of crypto funds, which includes not only crypto hedge funds, but crypto venture capital and crypto private equity funds. There are currently 622 crypto funds of all types. Though about half of the crypto hedge funds launched this year are based in the US, the rise of the crypto fund is a global phenomenon. Australia, China, Malta, Switzerland, The Netherlands, and the United Kingdom have all seen multiple crypto hedge fund launches in 2018. View more information on 2018 fund launches, including charts, graphs, and a list of 2018 crypto fund launches here. Crypto Fund Research (CFR) is the leading provider of analysis and market-intelligence on cryptocurrency investment funds including crypto hedge funds and venture capital funds. In addition to providing the industry’s largest list of crypto funds, Crypto Fund Research also provides institutional-level consulting and research reports.